Prolific and accomplished authors tend to recommend that a writer’s creative space be devoid of any stimulus in order to keep the writer focused solely on the work. I tried that for a while: bare walls, clutter-free desktop, seat facing away from the window. Although I understand the advice, those prolific and accomplished authors must be more comfortable with the feeling of loneliness than I am. Over the course of the last two years, I have slowly added “stuff” to my writing space. Stuff on the wall, stuff on the desk, stuff under the desk, stuff at the window. Of all this “stuff,” I have come to most appreciate the living things in my creative area. It started with an orchid in a pot and now includes a six-foot-tall potted plant. I have a hummingbird feeder and a birdseed trough attached to the outside of my window with suction cups. 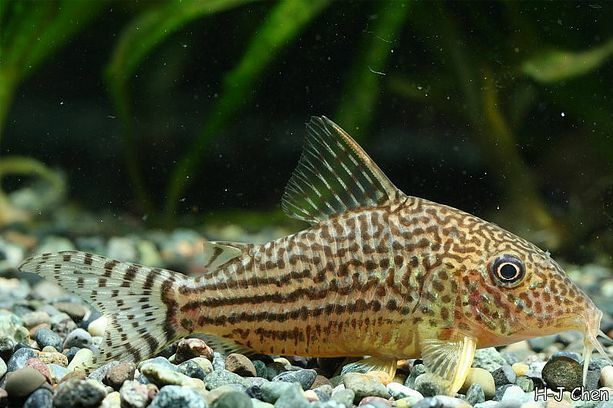 And as of this week, I have a new companion: our five-year-old cory catfish. For the last many years, our catfish had lived in a large tank all by himself. Save the occasions when the children remembered to feed him, Lucien lived without human contact. This reality –and an investigative report on solitary confinement of prisoners–led me to move him from the 10-gallon tank where he hardly moved to a tank 1/4 that size on my desk. Now I have the chance to see and talk to this fish everyday. I will admit that the fish’s relocation was more to alleviate my own feelings of irresponsible pet ownership in his involuntary banishment than it was to spice things up for him. Nevertheless, Lucien is the beneficiary of my feelings of guilt whether or not this tiny creature “feels” appreciation for our daily interactions. My 11-year-old son commented, “Lucien looks happy.” For the record, I am of the opinion that this species of fish (and perhaps all fish) has a pretty good poker face. Any emotion one might assign to the fish is at best a stretch and, more likely, a simple projection. I think my 11 year old was feeling “happy” himself in knowing that Lucien was now in the regular company of others and attributed his happiness onto the fish. This attribution is not just about the observations and subsequent conclusions of children. We all want to feel connected and without loneliness. At this moment in time, you dear reader and I share this planet. You have taken time out of your life to read the words I have written. Of all of the things you could be doing right now, you are here, in a metaphysical sense, with me. While I will likely never know who you are or what brought you here, I want you to know how deeply grateful I am for your presence. In the same way that I wonder whether the fish “cares” that he is part of my day, you should know that I care that you found yourself here reading these words. Happy to share this space with you. I have a lot of “stuff” surrounding my usual work space, but nothing alive except my lazy 15 year old kitty sleeping somewhere. It’s nice to know she’s around, though. I didn’t even mention our two dogs who routinely are under my desk. They are equal parts endearing and annoying. 🙂 I’m glad I’ve read this and my non-poker face would disclose a big grin. However, your first photo is not working, so I can’t admire your workspace. But I’m happy anyway. In agreement on “savviest”, but I wished to warn you that the photo doesn’t open at all, at least on my laptop. I don’t know if anybody else can see it. I just checked the blog, and I can see it. Who knows? Ghost in the machine?